William Thurman Hinshaw6,7,8 [William Thurman Henshaw1, Henry T. Hinshaw4]. Born Jun 13 18732,3,7,8,9, Jackson County, Alabama2,3,7,8,9 [Texas4]. He married Ruth Marcellus Robertson, Sep 14 1889.2,9 Ruth, daughter of Marcellus William Robertson & Nancy Wilson Chambers Reynolds2,3,4,7,9,10, was born Mar - 18742,3,4,7,9,10, Mississippi2,3,4,7,9,10 [Tennessee11]. Hinshaw, William, head-of-household, age 26, born June 1873 in Alabama; parents born in Alabama; married 10 years; occupation: blacksmith; rented home. Hinshaw, Ruth M., wife, age 26, born Mch 1874 in Mississippi; father born in Tennessee; mother born in North Carolina; married 10 years; 5 children, 3 living. Hinshaw, James F., son, age 9, born Feb 1891 in Alabama; father born in Alabama; mother born in Mississippi. Hinshaw, Lucy Z., daughter, age 3, born May 1897 in Alabama; father born in Alabama; mother born in Mississippi. Hinshaw, Auda H., son, age 9 months, born Aug 1899 in Alabama; father born in Alabama; mother born in Mississippi. Hinshaw, William T., head-of-household, age 36, born in Alabama; parents born in Alabama; first marriage, married 21 years; occupation: farmer, general farm; owned farm. Hinshaw, Ruth M., wife, age 36, born in Mississippi; father born in Tennessee; mother born in North Carolina; first marriage, married 10 years; 8 children, 6 living. Hinshaw, Lucy Z., daughter, age 12, born in Kentucky; father born in Alabama; mother born in Mississippi; occupation: laborer, general farm. Hinshaw, Auda H., son, age 11, born in Alabama; father born in Alabama; mother born in Mississippi; occupation: laborer, general farm. Hinshaw, Allie K., daughter, age 8, born in Alabama; father born in Alabama; mother born in Mississippi. Hinshaw, Horace M., son, age 4, born in Alabama; father born in Alabama; mother born in Mississippi. Hinshaw, Larrie S., son, age 1 year 6 months, born in Kentucky; father born in Alabama; mother born in Mississippi. Austill, James R., lodger, age 16, born in Alabama; father born in Alabama; mother born in Tennessee; occupation: laborer, general farm. Robertson, Nancy W.C., mother-in-law, age 77, born in North Carolina; father born in North Carolina; mother born in Mississippi; widow. Hinshaw, Henry T. [or L. - unclear], head-of-household, age 46, born in Texas; parents born in Texas; rented home; farmer. Hinshaw, Ruth, wife, age 45, born in Mississippi; father born in Tennessee; mother born in North Carolina. Hinshaw, Zelma, daughter, age 20, born in Texas; father born in Texas; mother born in Mississippi. Hinshaw, Audie, son, age 19, born in Texas; father born in Texas; mother born in Mississippi; farm laborer. Hinshaw, Haris, son, age 14, born in Texas; father born in Texas; mother born in Mississippi. Hinshaw, Larry, son, age 11, born in Texas; father born in Texas; mother born in Mississippi. Hinshaw, Austal, son, age 6 [unclear], born in Texas; father born in Texas; mother born in Mississippi. Hinshaw, Ennis, son, age 3 [unclear], born in Texas; father born in Texas; mother born in Mississippi. Hinshaw, William T., head-of-household, age 57, born in Alabama; parents born in Alabama; first married at age 15; rented home ($5 rent); no radio in home; occupation: retail dealer, poultry products; not a veteran. Hinshaw, Ruth M., wife, age 56, born in Mississippi; father born in Tennessee; mother born in North Carolina; first married at age 15. Hinshaw, Austell, son, age 16, born in Alabama; father born in Tennessee [sic]; mother born in Mississippi; single; attended school. Hinshaw, William E., son, age 13, born in Alabama; father born in Tennessee [sic]; mother born in Mississippi; single; attended school. Tifford, Vera D., daughter-in-law, age 18, born in Alabama; parents born in Alabama; married; first married at age 18. Henshaw, Ruth, mother-in-law, age 66, born in Mississippi; completed 1 year of high school; on Apr 1 1935 was living in rural Madison County, Alabama; widow. 1910 census, Collins Precinct, Jackson County, Alabama; ED 37, page 52B, line #88, dwelling #50, family #50. 1920 census, Precinct 4, Rains County, Texas; roll T625-1840, ED 153, page 15B, line #61, dwelling #292, family #294. Contribution from John Williams (). 1930 census, Gurley, Madison County, Alabama; roll T626-37, ED 32, page 6B, line #56, dwelling #144, family #150.
recollections of granddaughter of William Thurman Hinshaw. 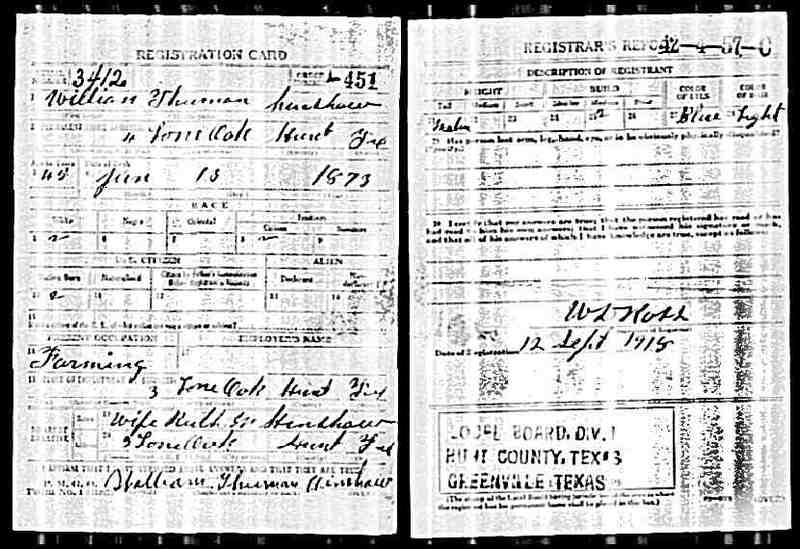 1940 census, Rains County, Texas; roll T627-4125, ED 190-5, page 9A, line #16, household #165. 1880 census, Bethlehem, Marshall County, Mississippi; roll T9-657, ED 121, page 609D, line #4. 1910 census, Collins Precinct, Jackson County, Alabama; roll T624-16, ED 37, page 52B, line #64, dwelling #47, family #47.